The state of US wholesale power markets: Is reliability at risk from low prices? Reactions at FERC’s technical conference in early May show electricity generators are concerned about falling revenues making their power plants uneconomic and are looking for market modifications to remedy this situation. In the first part of a three-part guest post series Robbie Orvis explores why generator revenues are shrinking and how the decline isn’t a problem for reliability. Utilities across the United States continue to announce coal plant closures and reaffirm previous plans to remove coal from their generation fleets. What’s behind this trend? And how can U.S. utilities profitably transition themselves and affected coal communities to a 21st century generation mix? In April, Department Of Energy Secretary Rick Perry issued a memorandum to his staff asking pointed questions about the future of the electric grid as coal is retired off the system. DOE’s publication of this memorandum presents an opportunity to uncover many outdated assumptions about grid reliability and understand what’s driving the unstoppable transition from coal to other technologies. The Trump Administration is attempting to alter America’s energy landscape. 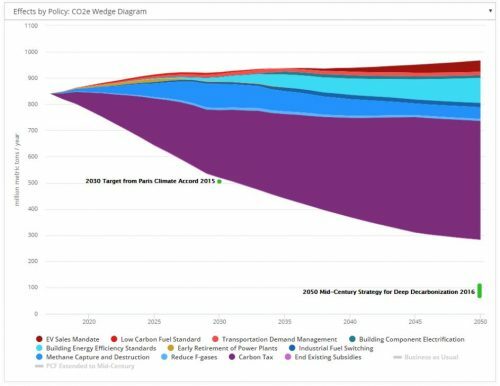 Energy Innovation used the Energy Policy Simulator (EPS) to forecast wind and solar capacity additions to 2050 under three scenarios: a business-as-usual (BAU) scenario, a low natural gas price scenario, and a solar import tariff scenario. Carbon capture and storage (CCS) has gained support in Congress as an answer to reducing emissions in the power sector – but it’s the most expensive option available. Our analysis shows coal plants equipped with CCS are nearly three times more expensive than onshore wind power and more than twice as expensive as solar photovoltaics (PV). The old utility business model is cracking as competitive energy technologies displace increasing parts of the utility service, taking some of the revenues that go with it. In response, multiple states are investigating models for a “utility of the future” to establish a reliable, resilient, affordable and clean electric grid. The Trump administration’s rollback of federal climate and clean energy policy has relegated renewable energy development to states (for at least the next four years). Northeast states are among the leaders but states across this region are also some of the most land-constrained in America. Will barriers to siting new wind generation and transmission in a land-constrained region stymie their efforts? As the renewables transition continues apace, flexibility will become increasingly important. Policymakers and investors will need to watch carefully how flexibility is paid for. Cheap natural gas and renewables are outcompeting coal-fired power plants on economics, pushing many of them into early retirement and leaving behind coal workers and communities. A newly proposed bill in Colorado aims to turn this economic challenge into an economic engine for utilities, electric consumers, and coal workers and communities. The Trump Administration’s pro-fossil, anti-climate agenda means states must lead renewable energy development in the near term, but will siting barriers in land-constrained regions impede growth? Siting projects for large-scale renewables is tricky even in leader states. New research seeks to solve the challenge of siting renewable energy and connecting it to the grid.